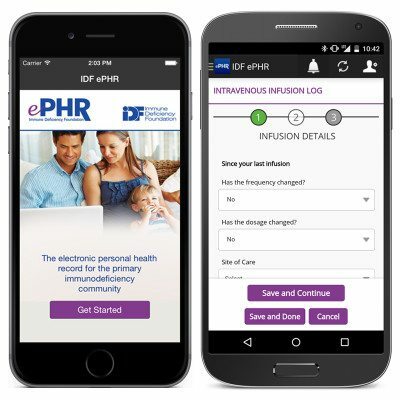 The Immune Deficiency Foundation (IDF) launched a new mobile app to further enhance the experience for its patient community using its IDF ePHR, an electronic personal health record powered by Get Real Health’s InstantPHR®. The app allows patients with primary immunodeficiency diseases (PI) to easily track their health information, including symptoms, diagnoses, medications, infusions and other critical health data. IDF announced the release of the app to more than 1,300 attendees at the 2015 IDF National Conference in New Orleans, June 26. IDF rolled out a desktop and mobile web version of IDF ePHR last fall and is now used by over 1,600 users. With the launch of the mobile app, patients will now be able to manage their health on-the-go by tracking goals, setting reminders and notifications in addition to viewing their info and keeping track of all their health conditions through easy-to-read charts and graphs. The national non-profit is the first organization to utilize the InstantPHR mobile app. Get Real Health customized many components of IDF ePHR to make it user-friendly and relevant for this unique patient population. Approximately 250,000 people in the United States live with primary immunodeficiency diseases. These diseases can vary widely in their symptoms and treatments, thus IDF needed a patient portal that was flexible and entirely patient-centered. InstantPHR® met those requirements. The addition of infusion logs was particularly critical for PI patients, so Get Real Health customized a feature that allows them to track their infusions on a regular basis, either by date, product or lot number. Additionally, patients can easily log their daily records through a newly built calendar feature as well as track side effects and allergies. One unique feature of IDF ePHR is that it is connected to the IDF Patient-Powered Research Network, PI CONNECT, which allows consenting patients to share anonymous data with the United States Immunodeficiency Network (USIDNET) for research. The long-term goal of PI CONNECT is to boost the efficiency of research and shift away from investigator studies to patient-centered studies, where patient experience is the driver toward change.